My very average brain is struggling to grasp how to compare color camera resolution to mono camera resolution. When I put the pixel size for the camera in Stellarium, and the focal length of the telescope, the program computes a resolution regardless of whether the camera is color or mono. In a 10x10 grid of pixels in a color camera there will be 25 red, 50 green, and 25 blue pixels. The mono camera will have 100 pixels reporting for all filters. If there is a mixture of colors in a DSO, then the resolution may not be much different between color and mono. If the DSO is entirely red in color, then the color camera has 25 spaced pixels reporting detail, while the mono camera will report detail from all 100 pixels with the red filter. Is the actual resolution dependent upon the color of the light coming from the DSO? As AP seems to always be more complicated then you would think, is the answer more complex? The OSC/DSLR will have 100 pixels in a 10x10 grid just like the mono camera. Each of those individual pixels -- OSC or mono -- will be an separate, unique sampling point. So as far as pixel "resolution" goes, the two are identical. What differs is how the final non-Bayer-pattern image is determined for the OSC, where for the mono it's just the pixels as they are. There are a variety of ways to de-Bayer an OSC image (you can see some of the options in processing packages, such as DSS, which offers at least 3 variations). In most of them, the software that does the work figures out a weighted "luminance" for each pixel (weighted by the filter color), and then figures out the color for that pixel by looking not just at the pixel in question, but at pixels around it as well. So what you wind up with is nearly full-resolution luminance, and color sampled from a 4x4 (or 3x3 or 8x8 etc.) group of pixels. Combining the two gets you a decent compromise: color is "smeared" a bit, but the weighted luminance makes up a bit for that. In the end, the mono sensor will have higher spatial resolution, but no color information; the OSC sensor will have lower spatial resolution (but not 1/4th the mono! ), but more total information since it contains color data. Simple version of the above, and further information. "Debayering" estimates a red value for the green and blue pixels by looking at surrounding red pixels, and calculating the estimate. While not perfect, that means the color resolution is significantly more than 1/4 mono resolution, although it's not the same resolution as mono. There is no way to calculate the resolution exactly, it varies across the image. More information about calculating the estimate. Bottom lines. Mono plus filters always has better resolution, but not 4 times as much. It's impossible to calculate exactly how much more. Different debayering techniques will affect things (covered in "more information"). Edited by bobzeq25, 20 March 2019 - 09:29 AM. Well live and learn, and learn and learn . Very good explanations and articles, thanks. I would like to mention for astrophotography, you usually stack many images to form a single image. Between each image you are likely to have some shift in the image, or the shifting is done through dithering. As a result, the resolution in the final image may not be different whether you use OSC or mono. The atmospheric conditions/pixel size/telescope aperture/focal length have far more influence on the final resolution. I would say that the most important factor is image scale. I have images with a QHY163M and a Nikon D7200 which have pixel sizes of 3.8 and 3.91 microns respectively. They’re similar enough to have done comparisons with a Sigma Art 85mm F/1.4 @ F/2.8. 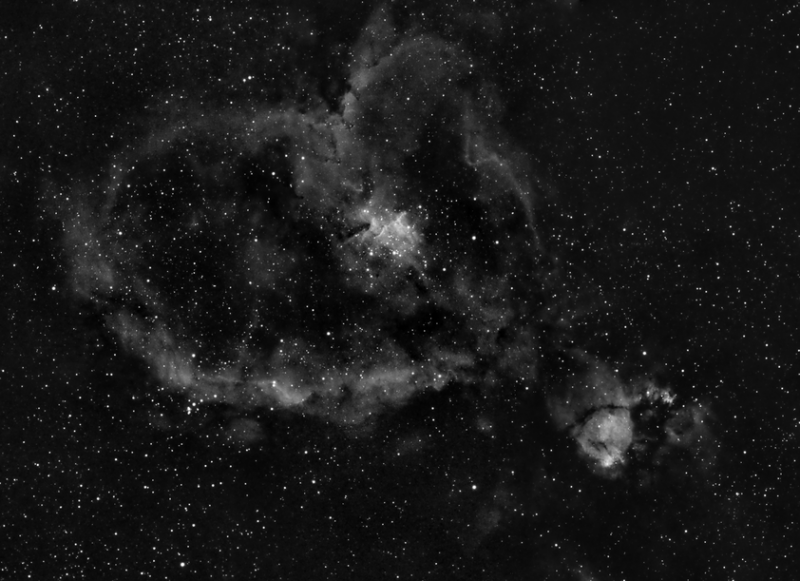 With the QHY163M in a stack image I had FWHM values as low as 1.2 pixels in the centre of field. It is a seriously sharp lens! With the D7200 the lowest I could ever achieve is around the 2.3 pixels mark and that is didn’t matter if I did a normal stack or CFA drizzle and then downsize. When under sampled a mono camera will yield sharper images because it isn’t being interpolated. If I was imaging with a Mewlon 250CRS, due to having an image scale of a tad over 0.3”/pixel, unless I was imaging under 0.5” seeing conditions there would be no difference in resolution as I would likely be getting a FWHM of 4-8 pixels out of both cameras. Is that a stock Nikon that has the AA filter still in there? The stock D7200 doesn’t have an AA filter like the D800E, D810 or D810A. I've found that one-shot-color images generally look best at somewhere between a 60 and 80 percent rescale in size whereas mono images can look good at full scale. You might consider this variation as representing the approximate difference in spacial resolution between the two different sensor types (one-shot-color versus mono, at least when the former is using something like a Bayer pattern). Having said that, if you dither your images and then follow that up with a drizzled processing you can probably get results with a one-shot-color camera that are similar to what you'd get with a mono (in terms of resolution). However, you can dither and drizzle a mono camera too so it's kind of a never ending "race." As OldManSky suggested, with a one-shot-color camera you sacrifice some resolution for gathering color information, while with a mono camera you sacrifice color information (during the capture of the luminance) to gather more resolution and never the twain shall meet (or said another way, you can't get something for nothing). Similarly, you sacrifice some signal-to-noise with a one-shot-color camera versus a mono camera, particularly in luminance and when comparing similar lengths of exposure or integration time. This is why with a mono camera and when using four separate filters (luminance, red, green, blue) you can approach the results that would be captured in any given length of time with a one-shot-color camera even when the red, green, and blue channels for the mono camera receive less total exposure time than was given the one-shot-color camera. This happens because of the efficiency of the luminance from the mono camera and its greater spacial resolution. That said, it is my opinion that given any fixed session time (say three hours) you'll never be able to exceed what could be captured with a good one-shot-color camera versus taking that same amount of time with a mono camera using separate luminance, red, green, and blue filters (in those same three hours). So, if you have a fixed amount of time you may do "better" (YMMV) with a one-shot-color camera than you would with a mono camera that has to capture separate red, green, and blue channels (at least in terms of color information, spacial resolution being a different matter). It's a complicated matter and that's why you will see some debate or differences of opinion expressed on whether color imaging is best done with a mono or one-shot-color camera. In any case, the seeing conditions, your sampling and image scale, your capture technique, and your processing skills will generally have a greater impact on the final results than whether you are using a color or mono camera. Edited by james7ca, 22 March 2019 - 05:53 AM. I've generally found that one-shot-color images generally look best at somewhere between a 60 and 80 percent reduction in size whereas mono images can look good at full scale. You might consider this difference as representing the approximate difference in spacial resolution between the two different sensor types (one-shot-color versus mono, at least when the former is using something like a Bayer pattern). Having said that, if you dither your images and then follow that up with a drizzled processing you can probably get results with a one-shot-color camera that are similar to what you'd get with a mono (in terms of resolution). However, you can dither and drizzle a mono camera too so it's kind of a never ending battle. As OldManSky suggested, with a one-shot-color camera you sacrifice some resolution for gathering color information while with a mono camera you sacrifice color information to gather more resolution and never the twain shall meet (meaning that you can't get something for nothing). In any case, the seeing conditions, your sampling and image scale, your technique, and your processing skills will generally have a greater impact on the final results than whether you are using a color or mono camera. Edited by theoatc, 22 March 2019 - 03:14 AM. This is a comparison of a stock T3i with bayer pattern, L extracted from the interpolated color image and the same camere with the bayer pattern removed. That's a great overview, thanks for making the video.